Malignant lymphoma is one of the prevalent hematological cancers. The prognosis and response to current treatment regimens is poor for patients with aggressive non-Hodgkin’s lymphoma (NHL). Thus novel treatment approaches are required for NHL patients. The EL4 murine tumor cell line was derived from a chemically induced lymphoma by Dr. Peter Gorer in 1945. EL4 has been extensively studied in immunological research. Preclinical studies of xenograft models are instrumental in finding new therapies for lymphoma patients. A 2009 study by Gao et al. published in Chinese Journal of Cancer investigated the antitumor effect of arsenic trioxide (As2O3) using the murine T-cell lymphoma cell line EL4 and the EL4 xenograft model. According to the article, As2O3 inhibited the proliferation of EL4 cells both in vivo and in vitro and could be used as a suitable model for treating advanced/refractory lymphomas. A 2007 Clinical Cancer Research study by Al-Ejeh et al. used the EL4 model to investigate the ability of 3B9, an La-specific monoclonal antibody, to target tumors. They successfully demonstrated that the antibody (Ab) targeted dead tumor cells, which is useful for radioimmunotherapy and radioimmunoscintigraphy with the use of the cell death radioligand. Finally, a 2016 study by Matsumoto et al. 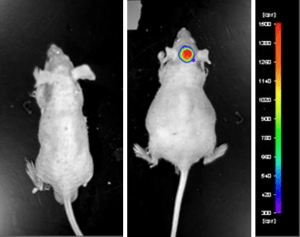 used red fluorescent protein-expressing EL4 cells to establish a xenograft model which they then used to demonstrate the feasibility of fluorescence-guided surgery to resect a peritoneally-desseminated tumor. The EL4 cell line (mouse lymphoma) is used to create the CDX (Cell Line Derived Xenograft) EL4 xenograft mouse model. 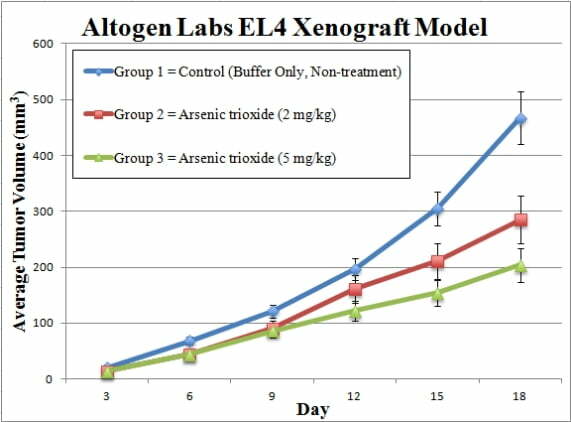 The EL4 xenograft model offered by Altogen Labs enables the study of monoclonal antibodies such as rituximab. EL4 cells used are maintained at a phase of exponential growth. The EL4 cells are collected, counted and viability is determined using a trypan blue exclusion assay (min 98% cell viability). Cell suspension concentration is adjusted to the appropriate density. All mice (NOD/SCID or athymic BALB/C, 10-12 week old) receive a subcutaneous injection into a hind leg that contains one million cells (volume of 100 µL) of the Matrigel-EL4 cell suspension. Injection sites are palpated up to three times a week. After establishment, tumors are measured utilizing digital calipers. The study begins when tumors reach an average size of 80-120 mm3. Animals are then randomized into appropriate treatment cohorts and the administration of test compound is performed. Mouse weights recorded up to 3 times a week and tumors are measured daily. The mice are euthanized as tumor size reaches the predetermined study size limit or 2,000 mm3. All necropsies and tissue collections are performed according to the study design. Tumors are excised and weighed; additional documentation is performed by digital imaging. Gross necropsies are performed; tissues are collected for downstream analysis. Tumors and tissues can be snap frozen, stabilized in RNAlater, prepared for histology or prepared for gene expression analysis.